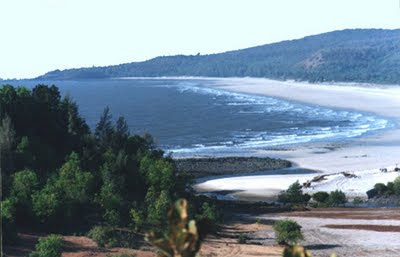 The sanctuary is located in Murud and Roha Talukas of Raigad district. The sanctuary extends over on area of about 53 sq. Kms. The sanctuary represents a Coastal Woodland Ecosystem of Western Ghats where atleast 21 species of endemic plants are found such as clitoria biflora, Balevia gibsoni, Ramphicapa longifolia. The ethrobotany of the sanctuary is represented by about 91 plant species. Considerable number of Medicinal plant species also do occur in the area. Sanctuary shelters wild animals such as Panther, Sambhar, Wild boar, Barking deer, Hyena etc.. The sanctuary habitat is very rich and offers highly serene ambience to the visitors, who can take trekking through a nature trail located at Supegaon and visit Nature Interpretation Centre at Majgaon. The famous Janjira Fort located in the sea and place of Nawab of Murud are also the places of attraction to the visitors. Nearest Airport: Mumbai ( ). By Rail: Roha (30 Kms.) on the Konkan Railway route. By Road: Mumbai (160 Kms.) and Alibag (50 Kms.). MAP : HOW TO REACH PHANSAD WILDLIFE SANCTUARY FROM RATNAGIRI?